Today you will picked early in the morning by our safari guide just after having your breakfast at 7:00am and transferred to Nyabigoma, Kinigi, Musanze district, Northern Province which is roughly a two hours and half drive from Kigali town, you will enjoy a lovely beauty of the unwinding rolling landscape of Rwanda country side that makes it famous as a country of a thousand hills, you can ask your driver guide to explain to you some of the eye catch along the way or stop for photography as you proceed. In a short time, you will be in the hearts of Iby’ Iwacu cultural village, a beautiful project employing and empowering the community and providing alternatives from poaching. You will later be joined by a local guide who will greatly welcome you to the village and takes you through an insight into the cultural history of Rwanda. The guide will take you through some of the programs such as visiting the huts, tasting the local brew, marriage ceremony, storytelling, and rap it with hilarious, fantastic dancers and drummers, who will showcase their traditional dance before you, and you can join. Lunch combined of local food, will also be arranged and served within the day, and later in the afternoon, drive back to Kigali for your overnight. Accommodation options: Marriott hotel (Luxury hotel) or Quiet Heaven Hotel (Standard hotel). Meal Plan: L – D.
Day 2: Visit to Nyamirambo Women’s Center. After your relaxed breakfast, you will be transferred to Nyamirambo Women’s Center to have a visit at the cultural center where you will have hands on Sisal Basket Weaving Workshop, walk tour around, and Traditional Cooking Class with Aminatha. You will also visit the art and craft gallery where you will have a chance to purchase traditional African costumes. In the later afternoon, you will be transferred to your booked accommodation or airport for your flight. End of the 2 Days Rwanda Cultural Tour. 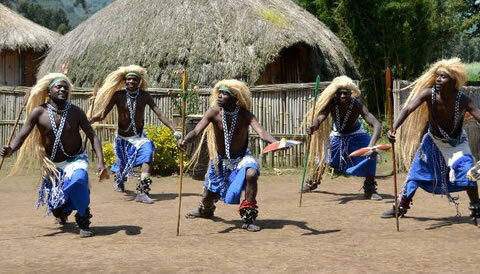 The 2 Days Rwanda Cultural Tour includes. Accommodation and meals as specified. The 2 Days Rwanda Cultural Tour package excludes expenses of personal nature like: Air fare, Visa, drinks, laundry, tips to local guides, telephone, porter fee while trekking, personal insurance, personal shopping bills and cigars.